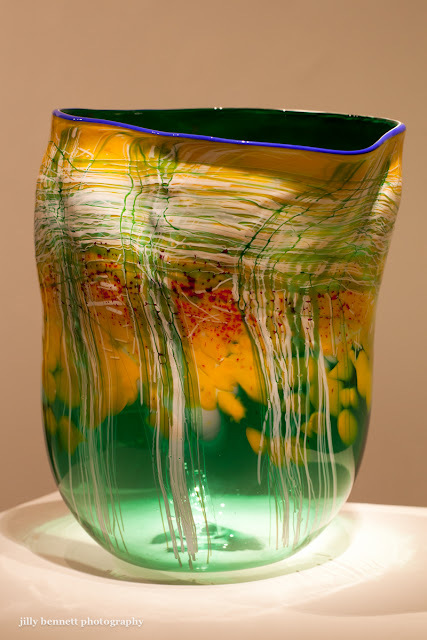 This beautiful vase by Dale Chihuly is on on display and for sale at the Marlborough Gallery on Port Hercule. The note alongside says 'Pine Green Soft Cylinder with Deep Blue Lip Wrap, 2002. Soufflé Glass. I've adored Chuhuly glass for years yet I've never actually seen any. I've seen films about him on television- working with the glass blowers of Murano, his installations at Kew Gardens and in America, so to actually see one of his creations was an absolute treat. I can tell you up front and personal, it is absolutely beautiful. Lovely photograph! Chihuly's glass seems to bring out the best in photographers.